"It's really a team effort. Josh always brings ideas for hardscape and landscape design that are compatible with, and compliment, the vertical construction. " 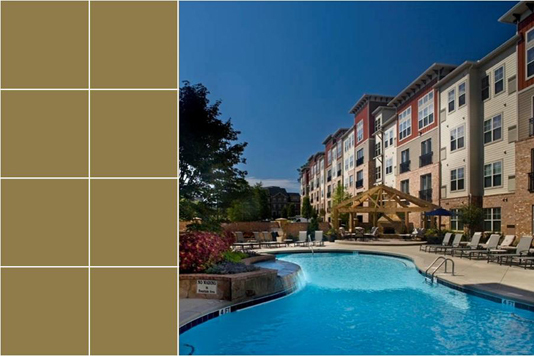 President, Pucciano & English, Inc.
A resort-style pool with water feature and outdoor cooking kitchen with stacked stone fireplace make this mid-rise apartment building a hidden jewel in a dense urban setting. Outdoor Fireplace Walton Ashwood is a 160-unit apartment community located on a 3-acre site in Central Perimeter. Josh Winter worked with Walton Communities to create a site plan and amenity package that effectively utilized the small site and that will continue to attract career-focused urban professionals. An efficient site plan was developed to include a four-story building, two parking decks and an amenity area. Comprehensive landscape plans included detailed construction drawings for an entry statement, on-site signage, a resort-style pool with water feature, a gazebo made of hand hewn wood, and an outdoor cooking kitchen with stacked stone fireplace. With so many upscale apartment and condo offerings in the area, it was important for Ashwood to have the right presence and an exceptional amenity package. Special attention was paid to designing a pool deck that takes full advantage of sun exposure and to accommodating water drainage in the pool area.